Now Up To 100% Profit! FREE Custom T-shirt Prize Plan for orders of 50 cards or more! Get 12 FREE Custom T-shirts for EVERY 50 scratch cards ordered. It’s an excellent incentive for your best sellers and as a gift to your volunteer staff. Please call us for details at 1-888-440-4114. Scratch & Help is a new, fun and easy way for your group to earn up to 100% profit! The Scratch & Help Card folds into 3 and can fit into your pocket. On the outside, it’s customized with your group name and logo so your supporters know where the money is being donated. When you open up the card, you’ll notice there are 3 panels. The left-hand panel contains the simple instructions. The second panel holds the coupon pad which has 30 coupons sheets, with 10 offers on each sheet. The right-hand panel contains 50 scratch dots with donation amounts varying from $0.50 to $3.00. How Do You Raise Money with the Scratch & Help Card? 3 Simple Steps! 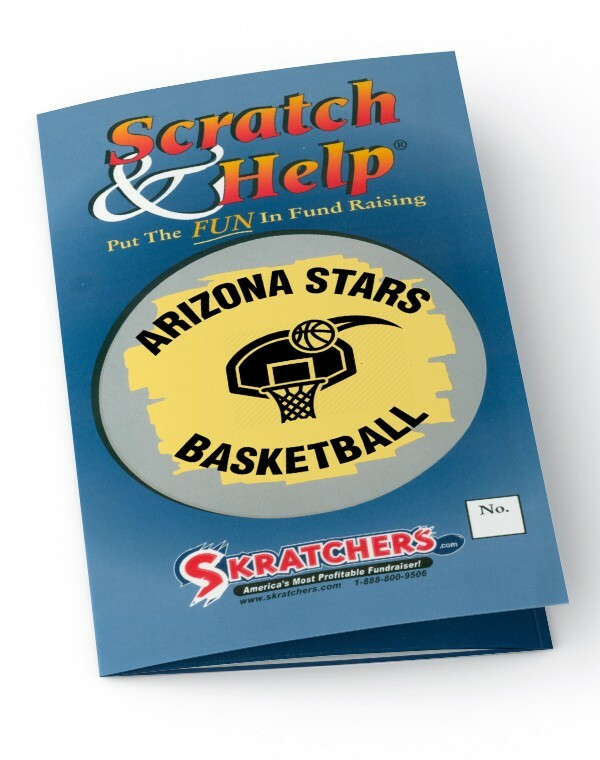 To kick-off your fundraiser, you’ll order 1 Scratch & Help card per fundraising participant. Step 1 - Each of your group member will approach friends, family, relatives and so forth and ask them to support your group by scratching 2 or more circles. Step 2 - The supporter will pay the total of the amounts revealed underneath the scratch dots. 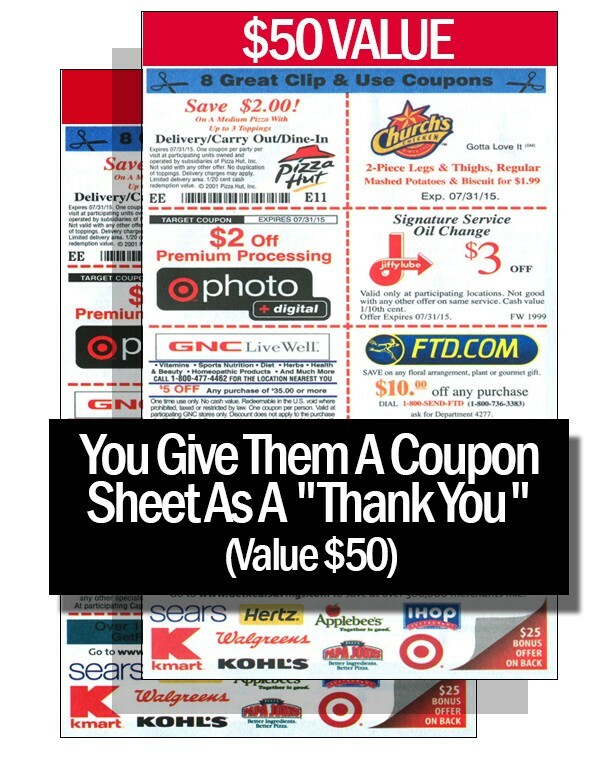 Step 3 - As a "Thank you", the supporter is given a full coupon sheet containing 10 coupon offers valued at approximately $50. 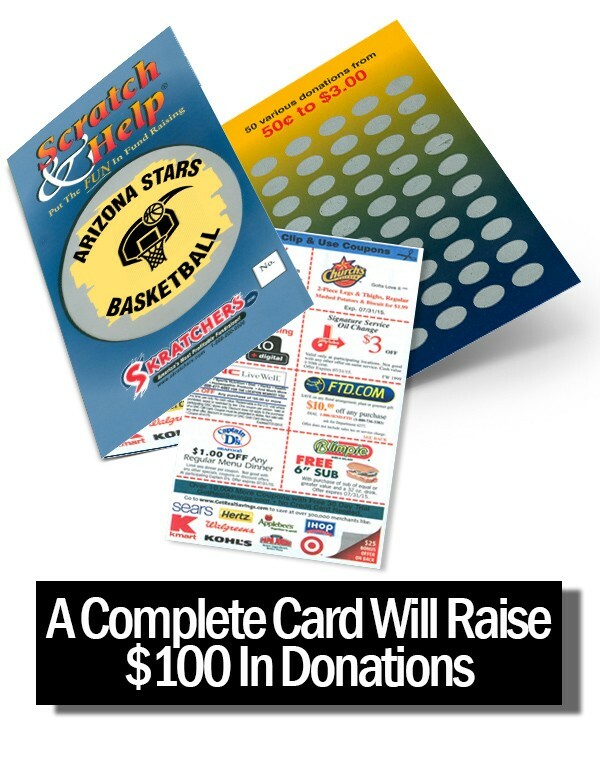 The fundraising participant keeps the Scratch & Help Card with them until all 50 dots are scratched-off by supporters. A complete card will raise $100 in donations and $80 profit for your group. With 20 kids, you'll raise up to $1,600 profit; with 250 kids, you'll raise up to $20,000 profit. And now, your group will make even more with our 20% bonus offer. Your Profit: Your group earns $80 profit per completed card. Bonus Cards: We give 20% free cards with every order of 10+ cards. The money raised with these free cards will cover the entire cost of your fundraiser. Priced to Sell: The donation amounts are between $0.50 and $3.00, very affordable and perfect for today’s economy. Value for Your Supporters: They give a token donation of $3-$6, and receive over $50 in coupon value in return! Exclusive Coupons: Each supporter receives 1 sheet containing 10 coupons from popular merchants in your area. Optional for $30 more: If you want more localized offers, we offer our Local-Customize It! Program - Read about Local Customize It (PDF). Delivery: Once we receive payment, it takes less than 1 week for you to receive your personalized Scratch & Help Cards. Free Shipping and Low Minimums: Shipping is always free for any order of 11+ cards, The minimum order is only 5 cards, A shipping fee of $5.00 applies to orders less than 11 cards. 20% free cards applies to all orders of 10+ cards that are paid up front. Call and ask about our special volume discounts on large orders. Note: order 1 card per participant. The amounts in the Profit Chart are your Net Profit, and have included any shipping costs. How Does The Scratch & Help Scratch Card Work? 2. Order 1 Scratch & Help card per participant, and tell us the name and logo you’d like to have printed on the Scratch Cards. 4. If 7 out of the 10 coupons aren’t good in your area, consider our Local Customize-It! Program. 5. You may pay using a credit card, money-order, or if you’re a public school you can issue a purchase order form. We also have 30-days financing available through a credit card hold. Call us for details. 6. Shipping is quick: We always ship out your product the next day following receipt of your payment. Depending on your location, shipping time is approximately 4-5 business days. 7. Prepare and send a letter to your group members and their parents so they are aware of the objective of your fundraiser, collection dates, and your contact info. 8. Keep track of who you have distributed a Scratch Card to. Ideally, have the parents pick them up so they become more involved in the fundraiser. 9. Your participants will ask people to scratch and donate, and in return give them an entire coupon sheet. They must collect their money on the spot. 10. Keep a tally of all the money you collect from each of your participants throughout your fundraiser. 11. When the fundraiser is complete, be sure to send a Thank You note to all parents and kids who participated. 12. Count the profit made from your fundraiser! Our goal was to raise $1000 for Technology, Software, and Outdoor Sports Equipment. We surpassed our goals due mainly to the generosity of one family. We have purchased, an IPAD with pencil, Fire Tablets, various computer software titles, tricycles, an Outdoor climber, soccer goal with ball, playground balls and hoola-hoops. I love the freedom of not having to sell a product. You simply scratch and pay and you're done. It's simple and easy. Anyone can do it. I am very pleased. We are raising funds to take players to Nationals in San Antonio and Dallas. I'm glad that I was given the chance to use the fundraising ideas from the company to raise money for our activity we are doing. Our group is trying to raise money for a year event that we do with our local community. we have invested in the scratch tickets and has been a great hit for us. Scratchers brings in a great profit. And we use it to pay for competition fees, costumes and equipment. The kids can focus their time on the show and less time on raising money. Thank you! Our FCA group will be purchasing Bibles for our students and paying for our End of the Year BASH to celebrate a great year!! Our team did awesome! We raised over $1000 in just 2 weeks. I can't believe how easy it was and fun. With this fundraiser the players will be able to have a huge end of the season party, trophies, medals, and t-shirts. We just begun a scratch card fundraiser, and we're giving them 55 free personalized t-shirts as well! With the money we raised we were able to throw our boys an end-of-the-season party to remember!! Thanks JustFundraising!! The only reason I was disappointed with the financial results was that people did not care so much about the fundraiser. Customer Service Rep worked hard to ensure my order was complete and sent out quickly.